Yes, I have a cook book addiction. Well a book addiction for certain. It’s extremely hard for me to walk out of a bookstore without having something in hand. Today I went into the Jo Ann Fabrics to get fabric for a sewing project. Because it’s 24 miles away, I had to look around the whole store. What happens, I leave with 5 new cookbooks. Two of them I know my daughter will manage to take off to college with her come fall. One I couldn’t resist because I am a huge fan. The second one was because I like to bake. The third was because my Mother in Law gave me a mini doughnut maker for a gift a year ago and I have only used it once. Now I’d probably had used the doughnut maker more if I had more than recipe for it, hence the new book. When it comes to cookbooks, I am like a kid In the candy store and I want them all. Can you guess which books the daughter will take? 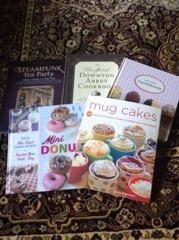 I am still contemplating my new recipe for the week, perhaps it will come from one of these new books. I can’t say for certain as I also love kitchen gadgets as well and have a tagine I have not used yet. So it really could be anything. My husband talked about going out to dinner on Friday, but I am thinking I might like to surprise him with something new that I have made. For those who wondered what recipe I used for the Coq au Vin, it was Julia’s of course. I share your addiction, passed down to me by my mum… can’t have too many! I am a book addict as a whole. Had to buy more bookshelves at IKEA to house what I have and quickly running out of room. My daughter is also the same way, thankfully I passed on the love to read and cook along to her.